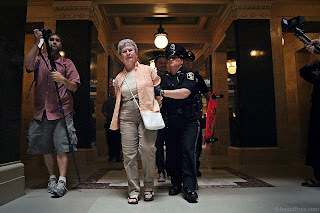 Cognitive Dissidence: Scott Walker - Unintimidated: The Sequel! We brought you the original Unintimidated last week, and now Scott Walker has given us a sequel! Once, Scott Walker clears the streets and the Capitol of women over 80, it might even be safe enough for him to come back to Wisconsin and actually spend some time here. Where's the blog? Did I miss it? Look at the picture you moron.